An airline is adding an additional flight from Aberdeen to Copenhagen. The number of flights to one of Aberdeen International Airport’s most popular destinations is to increase. Ambulance bosses have admitted that a man died in his garden as overstretched crews dealt with an “exceptionally high level” of emergency calls. Ambulance chiefs have launched an investigation after it took 90 minutes to reach a man who lay dying in his garden. The plastic problem in our seas was brought starkly into focus during an Aberdeen beach clean at the weekend. An environmental charity is holding a beach clean this week – hoping to be part of the biggest nationwide one ever. A former prison guard has spoken of his surprise after he received a gift from the elite squad of soldiers who rescued him during a hostage crisis. New images of the infamous Peterhead prison riots have gone on show to mark today’s 30th anniversary of the dramatic events. 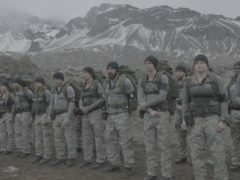 It’s no secret that Channel 4′s SAS Who Dares Wins is a brutal test of the physical and mental strength of its contestants, but the second episode of series two seemed particularly tough.